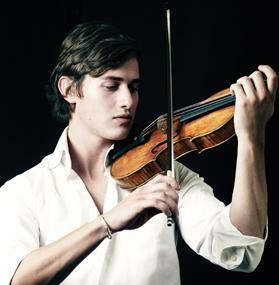 Alex Vella Gregory interviews Charlie Siem before his concert at the national theatre. Bruch in Rio? Playing concertos at the age of 15? Charlie Siem belongs to a new generation of musicians who offer a curious blend of traditional and new. Playing concertos in one’s teens seems to hark back to the days of child prodigies who, by adulthood, would have learnt most of the standard repertoire but not much else. The problem with prodigies is they very often get trapped in a musical stereotype that unfortunately for them has a very limited future. Thankfully, Siem is not that type of musician. His career has proved to be an original and highly-individual journey that continues to unfold along very unorthodox paths. He has managed to combine beautifully the skill and verve of the traditional virtuoso with the versatility and creativity of the 21st-century musician. “You have to play what you love and believe in, regardless of the response,” says Siem. Under the Stars, a CD that has just been released by Siem on the Sony Classics label, is ample proof of this. The CD is a collection of popular concert miniatures that embody the styles of such virtuosi as Kreisler, Hubay and Joachim. It is inspired by a violinistic tradition of virtuosi that came to an abrupt end with World War I. An important figure for Siem is that of the Norwegian violin virtuoso Ole Bull. Though he is a relatively obscure figure now-adays, Bull was a superstar during his lifetime. Siem is of Norwegian descent, something he is very proud of. Norway has a long and distinguished fiddling tradition which, although fundamentally different from the classical violin, does reflect a different ethos towards string playing. That element of folk and popular fiddling was also taken to new heights by the great 19th-century virtuosi who would improvise on popular tunes. Siem has continued that tradition by working with contemporary pop artists to create similar works. Advertising has been only too willing to capitalise on classical music to sell top-end products. Fashion, perfume, jewelry … they have often resorted to classical music to boost sales. Jenkins’ Palladio for Debeers and Handel’s Sarabande for Levi’s are but two famous examples. But what about classical musicians? Siem is one of those few who have taken the bold step to collaborate with major brands for their advertising campaigns. How does he feel about it? “I have been asked to represent brands, which does give me wide-reaching exposure. I hope it engages new listeners, but I’m a firm believer in doing things because you believe in them and not only to appeal to as many people as possible. Siem’s performance in Malta will be a first for him, in that he has never visited the island and has no connections here (save for being the proud owner of two Maltese terriers). He will be performing Saint-Saën’s Introduction and Rondo, a true showpiece in the virtuoso tradition, as well as the lyrical Violin Concerto by Bruch. He will be the star guest for this season’s opening concert at the Manoel Theatre, where he will be playing together with the Malta Philharmonic Orchestra under the baton of Brian Schembri. The Manoel Theatre opening concert takes place on October 3 at 8pm.